Ultracrab is an ultrasonic high frequency emitter, manufactured in a joint-venture custom series together with an high specialized company with more than 40 years experience in R&D and production of electronics emitters ultrasonic applied in field of the environemnt. What makes ULTRACRAB unique is the alternation of different impulse with high frequency and variable power. This ultrasonic anti-fouling is the first emitter which works with great efficiency with all kind of hull’s surface and specifically on metallic components. ULTRACRAB transmits patterns of differing harmonic frequencies. These changing sound waves are varied in time and intensity. This combination is extremely effective in causing damage to vacuoles or cell tissue inhibiting the growth and vital functions of algae and barnacles. Once activated, the performance of ULTRACRAB will be noticed with high efficiency specifically on hard parts (metallic components) as propeller, axes, helm, stern feet, flap or surface propellers. 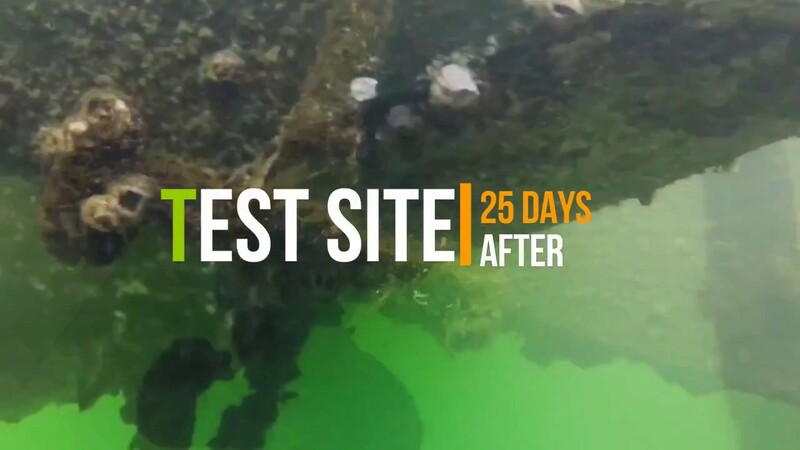 The ultrasonic waves produced from ULTRACRAB activate high vibration frequencies on metallic surface causing the death of algae and bernacles growing on it. ULTRACRAB is easy and versatile to install. All you need to do is float or install the transducer in line with the bow or stern of your vessel ( with sailboat) or in line with the centre of the back ( with motorboat). Tested have shown that best result can be achieved by switching position (front and back) on a monthly bases. For the installation on motorboat (mainly on the back) we suggest to collocate ULTRACRAB between 1 or 2 meter distance from the propellers in order to have best result. ULTRACRAB can work constantly on the boat. In fact its functioning is not harmful for any parts of the hull and it guarantees a constant protection against the formation of marine algae especially in spring or summer season when water temperature is higher. However the standard minimun working period suggested is of 20 days. Ultrasounds are present in a wide range of frequencies, beyond the range of human hearing (20Khz – 10Mhz). Sound propagation in water is carried out by a continuous dual phase wave transition: rarefaction, negative pressure and compression, positive pressure. Our ULTRACRAB offers a coupling technology that matches the transmission pulses to the water density. Installed outside of the boat submerged under water our transducer delivers highly effective ultrasonic waves resulting in increased acoustic pressure and penetration, covering greater distances. Ultrasonic waves: multi-frequency digital generator with automatic sequencing programs. Alarm output of no emission: auxiliary contact output (3A, 250V). Protections: surges, overheating and breakage of transmitter cable. Pilot lights: emission and voltage ON. The beneficial effect of ULTRACRAB ultrasonic waves make the cleaning of KEELCRAB SAIL ONE much faster and effective and completely harmless with regards to the surface of the hull. For the integrated system ULTRACRAB–KEELCRAB SAILONE we provide the integration of the electronic components in one unique electronic box with a saving on the price. Aeffe Srl is an Italian company that specializes in designing and producing new technology.